About a 5min walk from the home, an actual lazy river forms as the tide comes in and out. PERFECT for the kids. The stretch of private beach that's a 1min walk from the home is great too, especially for cocktails as the sun goes down. Great beach especially with children. There is basically a lazy river that pushes you into the wetlands. We enjoyed an afternoon of swimming, crab hunting, seashell gathering and sea glass collecting. We witnessed a great sunset too! Just be sure to bring bug spray.... when the sun goes down the bugs come out. Wood Neck beach is my favorite beach in Falmouth. It is not very crowed and there is a beautiful view. It is rocky but if you have water shoes it is fine. Wood Neck beach was a short drive and we were able to park there since they were not checking for Residence stickers yet. We loved the inlet size for both swimming, snorkeling, and finding shells and creatures with the grand kids. Go as the tide is coming in and enjoy a boogie board ride on the inlet entrance as the water rushes in. Would recommend wearing water shoes or toe covered sandals as it is rocky with lots of sharp shells. Beautiful, large beach, bring rubber shoes, will help with rocky sections of the beach, beautiful sunsets, take a cocktail to the beach and enjoy it at the end of the day. If you catch it near high tide there's a floating area that will take you 500-600 yards into a great inlet, pretty safe for kids , not very deep, like a water park without the charge, crowds and the insanity, nice gentle float, at a good pace. You need a beach sticker to get in and there are no facilities or snack bar, but it's great for kids. There's a shallow area where kids can hunt for shells and crabs and if the tide is going in the right direction you can ride the river out to the main beach. It also has a beautiful sunset view. 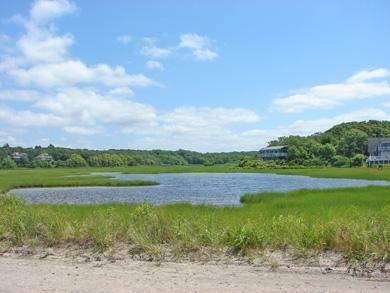 This beach has a bit of everything--a channel, salt marsh, tidal flats, sand bar. It is rocky on one end, but on the channel side, there is a reasonably-sized strip of sand to set up umbrellas, etc. Young children need to be very carefully watched if they play in the channel--the tides fill/empty the channel VERY quickly and the water can move very fast. 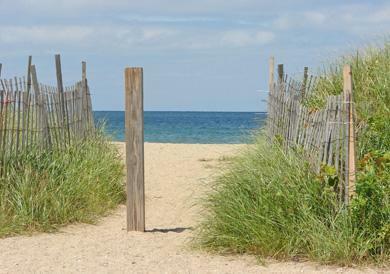 This is our favorite beach in Falmouth! 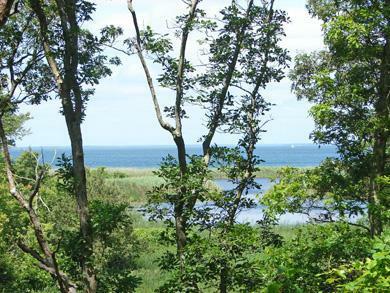 Rare Cape Cod escape with weekends available!